Going through a vault when a Skeleton Mage instantly killed me. Annoying, but not necessarily a bug. 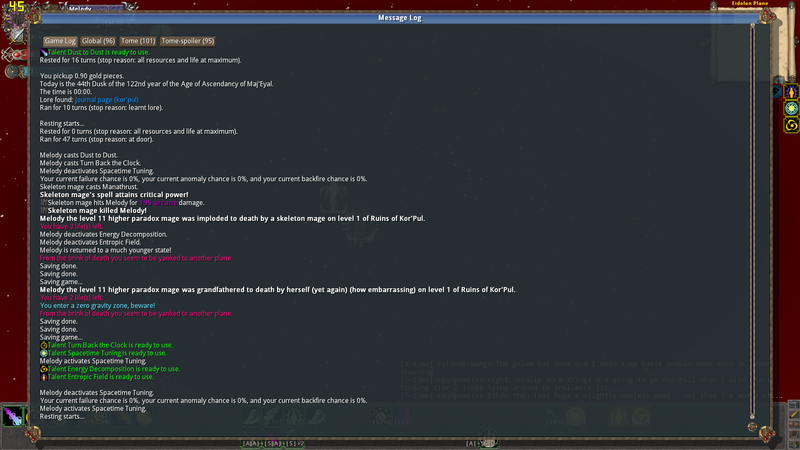 The fact that the mage cast one spell (manathrust) and somehow managed to remove two of my lives certainly IS a bug. From what I can read of the log (I don't really know what I'm reading it's mostly guessing), the mage cast manathrust on the same tick that I cast Turn Back The Clock. He killed me, and then somehow the projectiles from TBTC also killed me. Which should, of course, not happen. EDIT: I just noticed that this thread is in the wrong subforum (T-Engine 4 rather than ToME 4). If a moderator were to move it I would not complain.